This article is about the region. For the body of water, see Tampa Bay. For the city at the hub of the area, see Tampa, Florida. 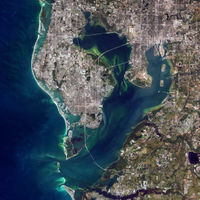 A simulated-color satellite image of the Tampa Bay Area. Taken November 3, 2015 with NASA's Landsat 8 satellite. 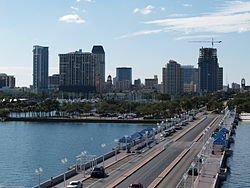 The Tampa Bay Area is a major populated area surrounding Tampa Bay on the west coast of Florida in the United States. The following is a list of important cities and unincorporated communities located in the Tampa–St. Petersburg–Clearwater MSA. Each of these cities has a population in excess of 100,000 inhabitants. Nearly 20% of Tampa Bay's population is in the 18–34 age group. From 2000 to 2004, total net migration for the Tampa Bay region was 262,961 or an average of 65,740 per year. During this time Tampa Bay accounted for nearly 20% of Florida's total net migration. The annual migration totals grew steadily since 2000 until 200 people a day moved to Tampa Bay in 2004. Two Tampa Bay region counties are among the top counties in the country for net in-migration. Pasco County ranks 8th in the nation for net migration and Hillsborough County ranks 13th out of more than 3,000 counties. The Tampa Bay area is located along Tampa Bay which it is named for. Pinellas County and St. Petersburg, Florida lies on a peninsula between Tampa Bay and the Gulf of Mexico, and much of the city of Tampa, Florida lies on a smaller peninsula jutting out into Tampa Bay. 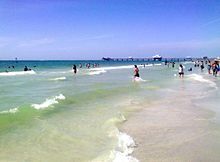 Pinellas County lies on a peninsula between Tampa Bay and the Gulf of Mexico, and much of the city of Tampa lies on a smaller peninsula jutting out into Tampa Bay. This proximity to large bodies of water both moderates local temperatures and introduces large amounts of humidity into the atmosphere. In general, the communities farthest from the coast have more extreme temperature differences, both during a single day and throughout the seasons of the year. Nearly one in four of the state's business and information services firms resides in Tampa Bay. [ citation needed] These firms range from financial services firms to information technology providers to professional services organizations such as law firms, accounting firms, engineering firms, consulting and more. As a gateway to the Florida High Tech Corridor, Tampa Bay is home to many information technology firms along with many business services providers. With more than 50 hospitals, dozens of clinics and ambulatory care centers, the Tampa Bay has an abundance of top-rated health care facilities for children and adults. The region also has a wealth of well-trained medical professionals—nearly 53,000 nurses and more than 9,200 physicians (including physician assistants)—provide care to Tampa Bay residents and visitors every year. Tampa Bay serves as the gateway to the Florida High Tech Corridor which spans 23 counties. Created as a partnership between the University of South Florida, University of Central Florida and now including the University of Florida, the Florida High Tech Corridor promotes the growth of the high-tech industry across Central Florida. Academic research is a key component of high-tech growth and a powerful economic engine. The presence of cutting-edge research in the region is vital to technology transfer, which enables innovative ideas discovered in academia to achieve commercialization in the marketplace. Tampa Bay has several powerhouse research centers that are engaged in both pure scientific research and aggressively pursuing technology transfer to enrich people's lives. Researchers at the University of South Florida's Nanomaterials and Nanomanufacturing Research Center (NNRC), H. Lee Moffitt Cancer Center and the Center for Ocean Technology at USF's College of Marine Science are researching how to use nanotechnology for a myriad of targeted uses including drug delivery, mechanized microsurgery, customized laser microchips, ways to turn sunlight into electricity, purifying water, storing hydrogen in small nanotubes, designing and developing marine sensors using microelectromechanical systems ( MEMS) and curing cancer. University of Tampa is located in Downtown Tampa, Florida on the Hillsborough River and is a historic university linked back to Teddy Roosevelt. Changes in house prices for the area are publicly tracked on a regular basis using the Case–Shiller index; the statistic is published by Standard & Poor's and is also a component of S&P's 20-city composite index of the value of the U.S. residential real estate market. The University of South Florida's Center for Ocean Technology, which has been a leader in microelectromechanical systems research and development and has been using the technology to collect biological and chemical data to monitor water quality, provided underwater technology for port security at the 2004 Republican National Convention. USF's Center for Robot-Assisted Search and Rescue used its miniature robots to assist rescue teams at Ground Zero following the September 11 terrorist attacks. Primary and secondary education is provided by the school districts of the individual counties making up the region. The area is home to several institutions of higher learning, including the main campus of the University of South Florida in Tampa and the satellite campuses of USF St. Petersburg. Eckerd College in St. Petersburg, the University of Tampa, Clearwater Christian College, Florida College in Temple Terrace, Trinity College (Florida) in New Port Richey, are all four-year institutions located in the area. Embry–Riddle Aeronautical University and Troy University also maintain satellite education centers at MacDill AFB. 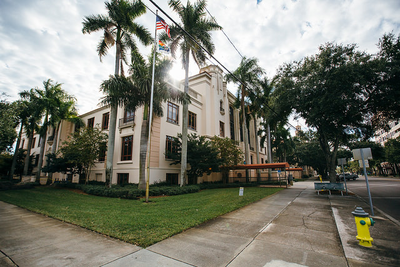 There are two law schools in the area, Stetson University College of Law and Thomas M. Cooley Law School. Stetson University has campuses in Gulfport and Tampa. 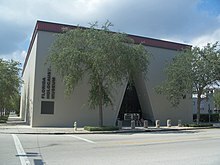 The newly built (May 2012) Thomas M. Cooley Law school is located in Riverview. Hillsborough Community College, St. Petersburg College, and Pasco-Hernando State College are community colleges serving the area. The Tampa Bay area is home to a high concentration of quality art museums. 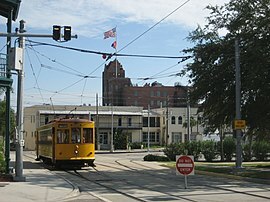 Long established communities, particularly those near the bay such as Cuban influenced Ybor City, Old Northeast in St. Petersburg, and Palma Ceia and Hyde Park in Tampa contain historic architecture. Fresh seafood and locally grown produce are available in many restaurants and in weekly farmers' markets in multiple urban centers in the area. Yuengling, the largest American-owned brewer, operates a brewery in Tampa, as does the highly regarded craft brewer Cigar City Brewing. Arts and culture make a big impact in Tampa Bay. In a single year, the economic impact of the cultural institutions in the Tampa Bay area was $521.3 million, according to a recent PricewaterhouseCoopers study. In 2004 5.6 million people attended plays, musical performances, museum exhibits, and other cultural institutions in Tampa Bay, supporting 7,800 jobs. Sports attractions, in addition to the teams listed below, include many professional quality golf courses, tennis courts, and pools. Ybor and the Channel District in Tampa, downtown St. Petersburg, and the beaches all along the coast all attract a vibrant nightlife. The Tampa Bay area is home to an extensive system of state, county, and city parks. Hillsborough River State Park in Thonotosassa is one of Florida's original eight state parks and Honeymoon Island State Park, near Dunedin, is Florida's most visited state park. Pinellas County is home to the Fred Marquis Pinellas Trail, a 37-mile running and cycling trail over a former railroad bed connecting Tarpon Springs to St. Petersburg. Skyway Fishing Pier State Park, the remnants of the approaches to the original Sunshine Skyway Bridge forms the world's largest fishing pier in Pinellas and Manatee counties. The shallow waters and many mangrove islands of the bay and gulf make the area popular with kayakers. The gulf is also home to a large number of natural and artificial coral reefs that are popular for fishing and scuba diving. Away from the coast, Circle B Bar Reserve in Lakeland ( Polk county) has been designated as a Great Florida Birding Trail site, a program of the Florida Fish and Wildlife Conservation Commission. 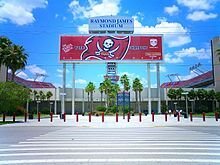 The Tampa Bay Area is home to three major professional sports teams—the Buccaneers (NFL), Rays (MLB), and Lightning (NHL). The Tampa Bay area also hosts a number of minor-league and college teams. Regardless of the specific city where they play their games, all of the major pro teams use "Tampa Bay" in their name to signify that they represent the entire area. The area is also home to several affiliates of the Gulf Coast League, a rookie league in which many young players gain their first experience in professional baseball. The 1999 NHL All-Star Game was held in Tampa at the Ice Palace. 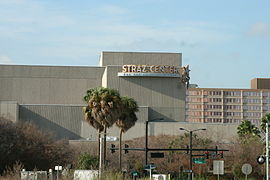 The 2004 NHL Stanley Cup Finals; Games 1, 2, 5 and 7 were played in Tampa at the St. Pete Times Forum. The 2018 NHL All-Star Game was held in Tampa at Amalie Arena. The 2017 College Football Playoff National Championship was held at Raymond James Stadium on January 9, 2017. Transportation in the Tampa Bay Area is heavily affected by its position around Tampa Bay. For more about marine transportation in the area, including the many bridges over Tampa Bay, see Tampa Bay#Transportation. Tampa International Airport is the largest airport in the region with 21 carriers and more than 17 million passengers served last year. In addition to the recent opening of a new terminal, improvements are being planned to handle 25 million passengers by 2020. St. Petersburg–Clearwater International Airport provides access to commercial airliners, and smaller charter craft. The airport is currently planning an expansion which will include new terminal facilities and runway extension. Dotting the landscape throughout the area, are many general aviation airports for the aircraft enthusiast and smaller corporate jets. Amtrak provides passenger rail service from Union Station in Tampa. CSX provides freight rail service for the entire Tampa Bay region. On July 1, 2007, an intermodal transportation authority was created to serve the seven county Tampa Bay area. The Tampa Bay Area Regional Transportation Authority (TBARTA) was formed to develop bus, rapid transit, and other transportation options for the region. The Tampa Bay Area is served by these interstate highways. Hillsborough County is also served by other roadways such as the Lee Roy Selmon Expressway (SR 618) which commutes workers from Brandon into downtown Tampa and the Veterans Expressway/ Suncoast Parkway (Toll 589) which serves traffic from the Citrus/Hernando County border southward into Tampa. In Pinellas County, U.S. 19 is the main north–south route through the county, and is being upgraded to freeway standards complete with frontage roads to ease congestion through the north part of the county. Also, the Bayside Bridge allows traffic to go from Clearwater into St. Petersburg without having to use U.S. 19. The Courtney Campbell Causeway (SR 60) is one of the three roads that connect Pinellas County to Hillsborough County across the bay. The other two are the Howard Frankland Bridge (I-275) and Gandy Bridge (U.S. 92). The Sunshine Skyway Bridge is part of I-275 and connects Bradenton and other Manatee County and Sarasota County commuters into Pinellas County. ^ a b "Cumulative Estimates of Resident Population Change and Rankings: April 1, 2010 to July 1, 2017". U.S. Census Bureau. Retrieved October 9, 2018. ^ "List of Counties Within MSAs". Census.gov. U.S. Census Bureau. Retrieved October 8, 2016. ^ "Tampa Bay Regional Planning Council: Our Mission". Retrieved August 18, 2017. ^ "Tampa Bay Partnership: History". Retrieved August 18, 2017. ^ "Nielsen Markets 2016" (PDF). ^ "Census: Tampa Bay saw 10th biggest metro population gain in 2017". March 23, 2018. Retrieved April 25, 2018. ^ "Estimates of Resident Population Change and Rankings: July 1, 2014 to July 1, 2015". Census.gov. U.S. Census Bureau. Retrieved October 4, 2016. ^ "1950 Vol. I. Number of Inhabitants". Census.gov. U.S. Census Bureau. Retrieved October 8, 2016. ^ "1960 Vol. I. Characteristics of the Population, Part A, Number of Inhabitants - 11 Florida". Census.gov. U.S. Census Bureau. Retrieved October 8, 2016. ^ "1970 Vol. I. Characteristics of the Population, Part A, Number of Inhabitants - 11 Florida, Section 1". Census.gov. U.S. Census Bureau. Retrieved October 8, 2016. ^ "1980 Vol. I. Characteristics of the Population, Part A, Number of Inhabitants - 11 Florida, Section 1". Census.gov. U.S. Census Bureau. Retrieved October 8, 2016. 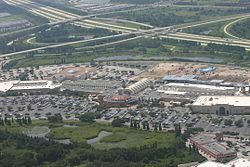 ^ "1990 1990 Census of Population: General Population Characteristics Report Number: CP-1 General Population Characteristics Florida Section 1" (PDF). Census.gov. U.S. Census Bureau. Retrieved October 8, 2016. ^ "2000 PHC-1. Summary Population and Housing Characteristics, General Population Characteristics Florida Section 1" (PDF). Census.gov. U.S. Census Bureau. Retrieved October 8, 2016. ^ a b "2010 CPH-1. Summary of Population and Housing Characteristics, Florida: 2010 Summary Population and Housing Characteristics" (PDF). Census.gov. U.S. Census Bureau. Retrieved October 8, 2016. ^ Little, Elbert L. (1978). Atlas of United States Trees. Volume 5. Florida. Washington, D.C.: United States Department of Agriculture, Forest Service. pp. 1, maps 159–256. LCCN 79-653298. This is the fifth volume of an Atlas with large maps showing the natural distribution or range of the native tree species of the continental United States. In these five volumes, maps of nearly all native tree species of the continental United States have been published... Florida merits a separate volume because it has more native tree species than any other state (except Hawaii), and because it has a large number of tropical species found in no other State.These trees of mostly limited range can be shown better on large-scale maps. ^ " Tampa Weather Forecasts Archived 2008-12-16 at the Wayback Machine" Yahoo! Weather. Retrieved on February 6, 2009. ^ "NowData - NOAA Online Weather Data". National Oceanic and Atmospheric Administration. Retrieved October 2, 2018. ^ "Station Name: FL TAMPA INTL AP". National Oceanic and Atmospheric Administration. Retrieved June 11, 2014. ^ "WMO Climate Normals for TAMPA/INT'L ARPT FL 1961–1990". National Oceanic and Atmospheric Administration. Retrieved March 10, 2014. ^ "Average Weather for Tampa, FL - Temperature and Precipitation". The Weather Channel. Retrieved October 3, 2011. ^ Major Employers Archived February 26, 2015, at the Wayback Machine, Tampa Bay Partnership. ^ "Is Florida the Sunset State?". Time. July 10, 2008. ^ "Florida hopes a rise in Indian Tourists after hosting IIFA 2014". IANS. news.biharprabha.com. Retrieved February 15, 2014. 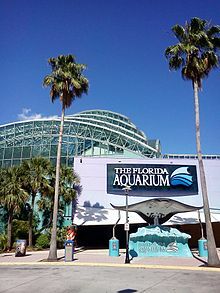 ^ "How high can the value of the Bucs, Rays and Lightning go? ", Tampa Bay Times, Robert Trigaux, December 1, 2014. ^ Baseball in Tampa Bay, A.M. de Quesada, Arcadia Publishing, 2000.